For one night only on February 23rd at The Dark Room in San Francisco Spy Emerson presents a very special installment of her ongoing performance project consisting of “anthropomorphic animals simply translating twisted human experiences”. 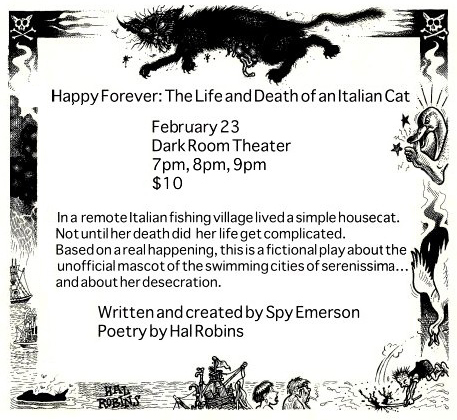 Based on a real happening, “Happy Forever: The Life and Death of an Italian Cat” is a fictional play about the unofficial mascot of The Swimming Cities of Serenissima, and features original poetry by famed artist, orator and oracle, Dr. Hal Robins. A cat lives a simple life on a rural canal not far from Venice. She is a witness to loneliness, and realizes her own existence just before her own death. The cat’s dead body then has an adventure of it’s own, as told by Hal Robins in his poem “Gatto Morto”. All proceeds from the show go to support Spy’s upcoming New York performance tour.